Delicious, crusty and full of aroma. The bread I received from Pearl Bakery had a great texture and was bursting with flavor. 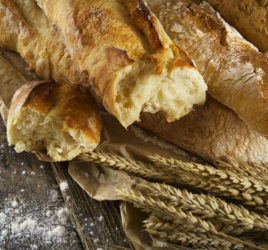 This is probably due to their different leavening methods and preferments that extends their fermentation and provides each variety of bread its own unique flavor. Pearl Bakery’s breads are made only with unbleached wheat flour, water, sea salt, and sometimes yeast. 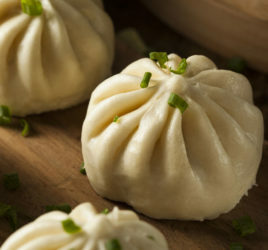 They do not add preservatives or dough conditioners. I examined their fermentation methods and these were what I learned. 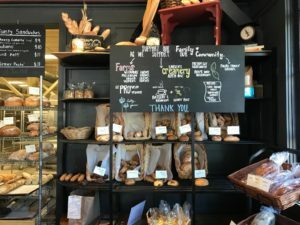 Pearl bakery’s shelf is stuffed daily with a large variety of crusty artisan breads. Pearl bakery uses a Poolish that is a liquid, yeast-based starter that is allowed to ferment for 16-24 hours before being mixed into dough. This starter imparts a nutty, rich aroma, crisp crust and soft, open crumb. Breads like their baguette, parisienne and ficelle use this polish. My delicious Wheat Levain loaf that has a sweet and smooth sour to the bite. Some of their breads like the Wheat Levain, Walnut Levain and Pane Coli Santi are made with a special levain. Levain is a culture of flour and water in which wild yeast and flavor-producing bacteria naturally occur. This is a traditional french sourdough, with a mild, complex tang. No commercial yeast is added to these breads whose pre-ferments require daily feedings of flour and water to maintain the delicate balance between yeast and bacteria. Pearl Bakery’s Pain au Levain is characterized by a dense crumb, chewy crust, and slightly sour flavor great with cheeses and charcuterie. A crusty loaf of Pane Coli Santi. Pugliese is their signature bread. It has enormously large holes with a delicious, chewy crust. A silky texture is created through the addition of extra virgin olive oil. Their Ciabatta is merely a smaller version of Pugliese. 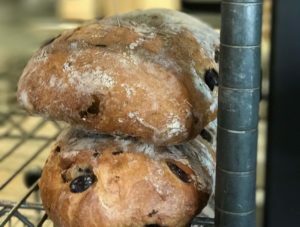 They also offer it in loaf that is jam-packed with kalamata olives. 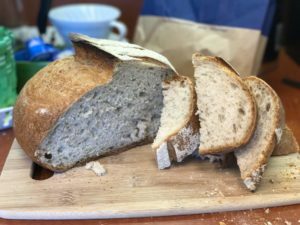 Their popular Paesano is an Italian country bread leavened with a pate fermentee: a portion of yesterday’s dough that is held over to spur fermentation and enhance flavor. A mixed starter is made from a hunk of pate fermentee, water and flour. This is fermented for a number of hours before being mixed into dough. With its fine, tender crumb and thin crust, Paesano is great for sandwiches bruschetta, or alongside a bowl of pasta. This dough also makes up our famous, hand-knotted Kaiser Rolls. 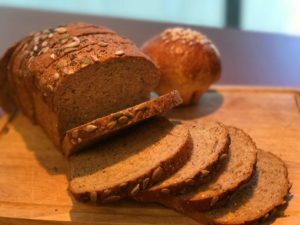 I ate their multigrain loaf that is loaded with whole grains and seeds, and it is absolutely delicious. The Pearl Bakery is a Portland staple. Nestled on the edge of the Pearl District near Powells City of Books, it supplies bread to well over 20 local restaurants and stores. What started as a small bakery in the late 90s has sure grown! The company is very environmentally conscious, from their packaging, to power source (pollution-free wind power) to their baking formula. Their artisan, hand crafted breads are made with organic, sustainable, local ingredients as much as possible. Probably part of the reason their products taste so good! 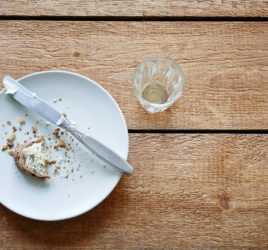 Is This the End of My Bread Diet? What a Journey it's Been!